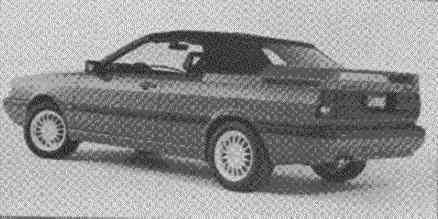 The following is an Audi Coupt GT Cabrio prototype built by ASC, Inc. It was shown at the 1986 auto show season by Audi of America. The GT Cabrio translates the linear proportions of the Audi Coupe into a design with a lower, sportier appearance. To achieve the look of the GT Cabrio, ASC developed an upper rear quarter panel extension which contains an integral rear deck spoiler of body color. The trunk lid of the Coupe GT was fully retained and blended with the body colored rear spoiler. The electro-hydraulically operated top stows completely beneath a filled boot. In the raised position, the Black Cambria cloth top fits flush with the windshield header for a smooth, aerodynamic appearance. To enhance the sports character of the vehicle, a blacked-out theme has been applied to the GT Cabrio's ornamentation; while body-color accent has been used on the front grille rings and steering wheel ring insignia. The taillights and rear reflective panel have also been blacked out as have the A pillars, wide body-side moldings and windshield header.